Today, we are publishing three new reports that examine the barriers facing our Civil Service colleagues from Black, Asian or Minority-Ethnic (BAME) backgrounds, those who have a disability or health condition, or who are lesbian, gay, bisexual or transgender (LGB&T). We also publish our plans on how we will respond to these reports. The findings of these reports demonstrate that while there are things we can rightly be proud of - and where we outperform other organisations - we still have plenty to do. Too many of our people are sceptical that the Civil Service is consistently committed to diversity and inclusion, and too often our colleagues from under-represented groups don’t feel like they can thrive and express their identity in the Civil Service. This has to improve. We know that difference of thought, background and culture leads to improved decision-making and innovation in organisations. The Civil Service needs the right skills and a wide range of the best people to meet the long-term challenges we face. The report findings, when combined with the data we already hold, give us our strongest evidence base yet with which to move forward. Our response is comprehensive and ambitious. This plan won’t sit on the shelf. It commits the senior leadership of the organisation to delivering tangible change by introducing a two-year ‘catalyst’ programme to embed diversity and inclusion as a genuine business priority in departments and agencies. At the same time, we are also launching an important internal campaign called ‘Challenge-Change-Champion'. The Leadership Statement asks that all Civil Service leaders: "Champion both difference and external experience, recognising the value they bring". The purpose of the campaign is to get everyone to think about what this means in practice, to challenge themselves and their own assumptions and to ask what they can personally do to ‘champion difference’. 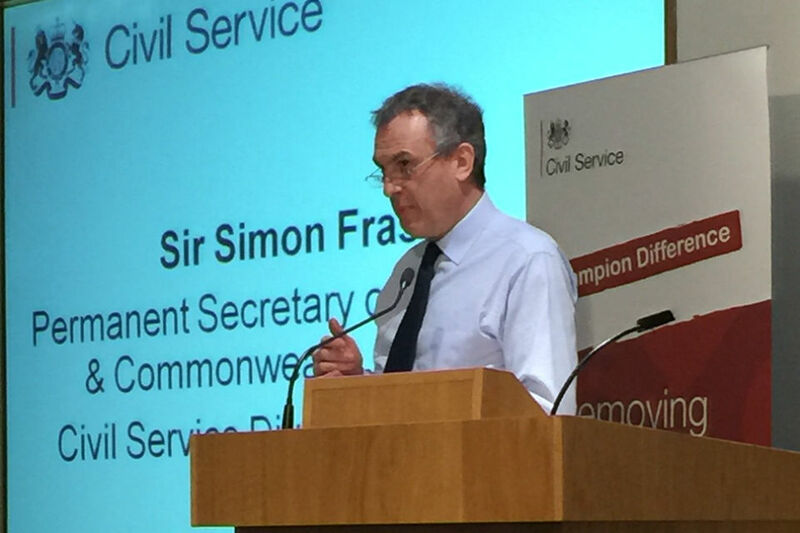 Making the Civil Service a more inclusive place to work is one of the top priorities for the Cabinet Secretary and the Civil Service Board, but it is not just the job of senior leaders alone, it is something we all should do. As line managers, as colleagues, as frontline staff interacting with customers, as leaders – we all have a role to play. Most of us like to think we are open-minded and inclusive yet, staff survey results show that many people feel they have experienced the opposite at work. Whatever you do, we can all send messages that we champion difference – partly through what we say, but mostly through what we actually do. My own personal pledge is that I will actively and personally promote more effective and personal unconscious bias training for all managers in the FCO, starting with a refresh session for the management board. I ask you to join me and challenge, change, champion. Together, we can make a difference. Hi. I’m happy to see attention being given to these issues. However, one thing I would like to see which doesn’t immediately appear to be addressed in the reports, is acknowledgement of the diversity of the T part of LGBT and recognition that not everyone fits a stereotype of male or female. On one hand, LGBT inclusion is promoted, but on the other hand a:gender which is promoted as ‘the network for trans and intersex employees’ (as described by Sue Owen in her blog on the 24th March) states that it is for staff who: ‘have changed or need to change permanently their perceived gender or who identify as intersex’. CSRA also has, in bold, on its front page: ‘CSRA only focuses on supporting lesbian, gay and bisexual civil servants – not trans* civil servants’. The question that immediately comes to mind is: where is the network which does support the wider group of trans* civil servants? CSRA and a:gender both give the impression that they don’t; which undermines the overall message of inclusion. If you look at Stonewall’s recent report announcing extending their remit to include campaigning on Trans equality, they appear much more trans inclusive than CSRA or a:gender give the impression of being, at least from their websites (report available here: http://www.stonewall.org.uk/media/current_releases/11191.asp). I think it’s important to recognise that the T part of LGBT is diverse, that the families and friends of transgender people are also affected by transgender discrimination and exclusion and as Sue Owen rightly pointed out in her blog of 24th March: ‘It’s so important that we remember why we’re all here in the first place – we are here to serve our communities across the country’. I think an important part of serving our communities is recognising their diversity and the diversity of the colleagues we work with, so that we can do so as effectively as possible. With that in mind I’d like to request that the diversity of the T part of LGBT is recognized and that a:gender becomes more broadly trans inclusive. I have an old book written when it was still a crime to be gay and about homosexuality it says: ‘The world is full of people who are “different”; there are those who are different in the right way, who should take satisfaction from their achievements, and those who are different in the wrong way, who should seek expert advice’. This could have been written today about people who don’t fit societies’ idea of what it is to be male or female. I have sought expert advice in the past and (paraphrased) I was told it’s a normal part of human diversity, you have a pretty healthy approach to dealing with it and I’m really sorry, but people like you aren’t accepted by society. We can either help you ‘transition’ or help you with depression if you get depressed. I feel there is something seriously wrong when I am told this by medical professionals and then come to work and get told ‘diversity is really important’, but the unspoken words often appear to be: ‘but, that doesn’t include people like you’. As I’m a positive and constructive person: I do realize that there are people trying to address the issues that remain and this is a positive blog post. I hope the action plan moves things forward. Please start recognising that people are people; they don’t all fit stereotypes of male and female. The civil service says it wants to tackle barriers to progression of (so called) T people, but doesn’t recognise the diverse ‘T’ people it already has working for it! I Whole heartedly agree with all the comments mate here. I have worked for the civil service for ten years and faced these same barriers and am still an AO. Previously I was a Warehouse and Project manager, with these skills I could still make a difference but will I ever be given the opportunity to demonstrate my talent? I do also wish that people wouldn't say LGBT, being T isn't about sexuality it's about identity. The Civil service needs to take a closer look at it's paraphrasing. I am a woman with a Trans History and proud of that fact. I do hope in the long term that the seed that is being sown here will be watered and allowed to flourish. Why are are you not challeging ageism? I couldn't agree more. As someone both bisexual and with a non-binary (ie not exclusively male or female) gender identity, I tend to feel excluded - to the extent that trans* issues are mentioned at all, they focus entirely on binary gender transition. The whole approach feels rather prescriptive - 'these are the recognised diversity areas, and the rest don't matter'. I realise that to an extent this is just a reflection of societal norms, and that (especially on the non-binary point) it might be a tad optimistic to expect the Civil Service to be at the forefront. But that doesn't make it any easier to deal with, and it doesn't mean we should put up with it. My colleagues see me as Di the Work Coach and person NOT as LGBT or mixed race. Just who is it further up the chain of command who is so discriminatory? The language is clear "these people" NO we are all people. Until all ratings whether for promotion or end of year box markings are carried out by result (allowing for pay differences), there will be no ultimate equality. I am a proud Civil Servant who happens to fall into the Disabled grouping and this statement does not go far enough for any of us. Instead of us 'pledging' to make an effort which is how this reads, it should be brave and bold. I expect my Senior Leaders to stand up for me and take positive action and in turn I will stand up for myself and others. (a) MANDATORY for all to complete unconscious bias training. (b) Annual appraisal expectations should reflect that ALL HAVE TO TAKE POSITIVE ACTION to 'challenge, change, champion' and then at the end of year staff should be evidencing how they have done this. If we are truly commited to making the change and role modelling to UK bisinesses then lets get on with it. (a) when will the Civil Service wake up to age discrimination? In my Department's People Survey last year, 10% of those saying they had personally experienced discrimination at work identified that discrimination as age-related, well ahead of the proportions reporting either ethnic background or disability discrimination. (b) just because someone is a white, Anglo-Saxon, Protestant, heterosexual, not-disabled male (to overegg the pudding, perhaps) doesn't mean that they don't have barriers to getting ahead. Or, conversely, just because such people are over-represented at the top doesn't mean that those of them who aren't at the top don't need encouragement and development. One of the main barriers in applying for new roles is the requirement to inform your line manager whenever you are applying for a job, This puts off many potential candidates both BME and non BME, as it can strain relationships if the candidate does not end up getting the job. The necessity for this requirement has never been satisfactorily explained. A lack of diversity is a massive own goal for the civil service as it encourages "group think" where senior levels in the civil service are dominated by people from the same background who who tend to think the same way, thus innovation and creativity is missed. A lack of diversity also misses out on talent that would otherwise be available. Anything that can be done to encourage more people to put themselves forward should be adopted including removing the requirement to inform your manager whenever you apply for a job. If there are any issues over suitability this should be picked up on the application form. The private sector does not operate in this way, and their productivity and sickness rates are consistently better than the civil service. Leslie, I've never informed my line manager that I've applied for a job? As far as I'm aware CSJ site doesn't automatically do this either? As some one who put a job application in last night there is a check box question in there that reads along the lines "I have informed my current line manager about this application"
I completely agree with this point made by Leslie. Some managers, when informed by their staff member that they want to apply for promotion, abuse their power and do whatever they can to stop the staff member from getting that promotion. As a mentor to some junior staff, I here about this problem all the time. This power needs to be taken off line managers. If someone is not suitable for promotion, they will be sifted out. Line managers should not have the power to "support" or "not support" a persons desire to apply because they will be doing this based on opinion and bias. I also agree with Leslie. I am lucky enough to have a manger who understands that there is no hope for me progressing where I am, so naturally I am eventually going to want to transfer elsewhere. However I don't like being forced into making him aware. If I applied to the private sector (and some government agencies) this wouldn't be the case, so it shouldn't be any different when applying to other government departments. I would be more agreeable to it if perhaps he/she were informed at the interview stage, but certainly not when I've filled out an application form. It's enough to not get beyond the initial stage, but I'd rather keep such details to myself. Just another civil service procedure that puts me off. As for those struggling to progress in the CS, I agree with many points being raised. I know someone who joined at the same time as I did and is now two grades above me. I have tried. I cannot say I feel valued enough to stay long-term because I am not being pushed upwards. I am doing my best to take advantage of opportunities but it isn't enough. It's demoralising. I know I am capable of doing better but there is a lack of career guidance and I feel somewhat low in morale at the moment. I hope that prospects improve for all who have the skills, ability and potential. That's what the civil service supposed to be about....apparently. How about asexual staff? We aren't even MENTIONED in the report! Oscar Wilde said 'we are all born in the gutter, but some of us are looking to the stars'. I say, 'its no shame to be born in the gutter, but its a shame to want to stay there'. My experience of the Civil Service is that it does not recognise diversity, talent or real world experience and would rather recruit people with no experience as long as they have the right 'route' or background. I come from quite a deprived background. At school our headteacher told the assembley, 'all of you girls will end up on the streets, pregnant or on the dole and all of you boys will end up in prison, dead or on the dole'. Pretty inspiring stuff I'm sure you'll agree. I had a teacher who told me he would bring a baseball bat in and 'wrap it around' my head simply for asking to move out of direct sunlight. I had a maths teacher who slapped me around the face for questioning him on a calculation, and perhaps worst of all (and a fact stolen by comedian Micky Flanagan) a careers teacher who when I said I wanted to drive a van like my brother told me 'I wouldn't set your sights so high'. Despite this, I ran my own successful business for a few years before being involved in a road traffic accident, smashing my back, knees neck etc and was signed off work for five years. I retrained and rehabilitated back into work in the CS continuing my studies after work and at weekends and was finally admitted to the roll as a solicitor in 2013. Yet I cannot progress above EO in the Civil Service. They do not recognise the CILEX route to qualification (working whilst learning). I am told that I am in an adminsitrative grade and despite having worked on some of the most high profile cases, a history of individual caseloads, having been commended on numerous occassions, recieving Box A markings throughout, I am ALWAYS told, 'oh you haven't got enough experience' 'oh you need to have have managed your own caseload' 'oh you need to have undertaken an advice role'. Alternatively, I am told I cannot apply for graduate schemes as I am 'already qualified'. Yet I see graduates straight out of college and people who attended the right university or even staff who look fantastic on paper yet are lazy, feckless and see the CS as a 'jolly' being put in place, promoted and given opporttunites whilst I am told to 'show them the ropes' and guide them through the process. I do not label myself Disabled although I am classed as such under the Equality Act. I do not define myself by my horrendous upbringing. I am simply a very hard working individual that, like anyone, has an identity forged by their experience and wants to develop to the maximum of their potential. Yet it seems because of that identity and because of those labels I (like millions of others) have the door repeatedly slammed in my face by the Civil Service. I feel like I am back in my school being told that I will never amount to anything and told to 'know my place'. I have given loyal and long service which is recognised in a series of box A markings and commendations and feedback, yet I have no chance of building on that or utilising ten years of hard slog on top of a full time demanding job in difficult circumstances. I honestly do not have any confidence that this will change and that is such an incredibly sad future but also exceptionaly unfair to loyal and hard working individuals in the CS who are not allowed to showcase their abilities, talent and experience. I often wished I could walk into a promotion interview and a "black" person is on the panel. I have lost out on promotion because the candidate selected "went to Cambridge University" and I am quoting from my feedback here! As a black man originating from the Caribbean I have no chance, I cannot compete despite having all the necessary skills to the point where I was quality checking the new persons work for his first 3 months! 19 years working for the CS and I have seen many new programmes to promote diversity but we seem to take one step forward and 5 steps backwards. I think discrimination in selection and promotion is now worse than 10 years ago as "experience" is now too expensive for the organisation. There is always some "plan" when the media shines a light on these issues but I am yet to see any results to indicate true committment to promote real diversity. Women have fared well but who else? and how many from truly minority backgrounds? I am not convinced. Like Susie I also am a proud Civil Servant with 31 years service but following a recent move from one part of DWP to the BD side I am now experiencing a real lack of understanding for my disability. Qwerty put it well 'people are people' so why am I being put under so much stress to be like a fully able bodied person and achieve the unrealistic targets if they struggle to achieve them what hope do I have? What we have in common is more important than our differences and it is important that this idea is not lost. As professionals we leave a lot of our personal concerns and interests at home, and hopefully we will have a corporate vision that all (or most) can buy in to irrespective of race sexuality etc most of us rub along pretty well together, learn from each other and sort out our differences like mature adults its important that our ability to do this is not underestimated. I would like to start by acknowledging the fantastic efforts and achievements of the BAME group, as a member of an ethnic minority and with more than 37 years of experience in various Civil Service Departments, I’d like to think that I have a different perspective to offer with regards to the findings of the research. As a an ethnic minority woman I often feel that with all the support being given, when one actually achieves a promotion, or is recognised for work produced, there is an institutional understanding that this promotion or even recognition, is not down to the skills, qualities and experience that one may possess, but instead a result of the support provided through the BAME group. In essence, I become a box that has been ticked to further support the department’s position on BAME hiring. In a way the existence of BAME, in my opinion still highlights the fact that as an individual of an ethnic minority I am somewhat different to my colleagues who are not part of an ethnic minority and although factually that might be correct, it totally goes against the values that I as an individual believe that Britain has displayed and continues to display, that we are a multicultural society. Perhaps, it would be better if BAME was incorporated into existing talent orientated programmes to ensure consistency in opportunities for all individuals in civil service departments, one that does not segregate individuals within teams based on their ethnicity, but instead the level of skills and the direction in which they are headed. I am not in any way criticising the efforts of the BAME group, instead welcome the findings and comments to 'challenge, change, champion', but I feel that with the personal experiences that I have had, it would prove more productive to stop focusing on the minority aspect, and focus entirely on skills, talents and the ability to do a particular job. It was a great event yesterday launching 3 excellent and very frank reports with direct quotes from the front line. While it was timely to acknowledge the progress made in the last Parliament, it lines us up well for the real work about to commence. This is all very good but it's just lip service to a cause. I have arthritis and I work as a listcaller in a Magistrates' Court close to home, in fact within walking distance. I've worked here for 9 years. If I want to progress my career I've been told that I would have to travel the 10 miles to our Court Centre and work there but I wouldn't be able to do this journey there and back each day so I am held back. I have been bullied relentlessly because I refuse to go there to work over the Christmas period and some of my colleagues resent me for being able to work here when they have to be on a rota to come here. I've told them that if they want to have my pain as well they would be welcome to it! So don't tell me about 'equality in the workplace'. It's a nonsense! Val that's a really difficult situation. We all recognised there was sometimes a huge gap between the messages from Whitehall and the reality on the front line. Hope it works out somehow. try Access to Work with help with transport ie taxi transportation, i am on this scheme and it has helped me tremendously. i have been on it for over a year now, i like you have arthiritis and find long journeys painful and uncomfortable. The scheme is run by DWP. Since when did the employer (in our case the British state) think it had the right to influence or interfere in our unconscious in any way? Unconscious bias training not only oversteps the wage-labour relationship, it also promotes a deeply reactionary view of human nature as essentially biologically determined - naturalising the idea of bias as a product of our pre-historic past over which we have limited control. This Orwellian nonsense should be scrapped. I think your employer has a perfectly reasonable interest in satisying itself that you are not - consciously or otherwise - allowing an irrelevant bias to influence your dealings with people that you come into contact with in the course of your duties. It also covers the responsibilities managers have to develop ALL their team members and to promote a more cohesive and inclusive culture and working environment. I know that the Unconscious Bias training was probably recommended because it is meant to encompass all the protected characteristics but I think the issues continually raised by BAME are almost identical to those raised by employees who share other protected characteristics. Definitely worth a look. Now I have investigated the subject BAME and LGB&T, I can support the idea that we should treat people who belong to these groups with the same respect as all of our other colleagues and fellow humans. However, if we invent new sets of initials to represent these groups with little explaination to those outside the circle of people in the know then we are in danger of creating and enhancing the very thing we are campaigning against. During my 26 years in Civil Service I’ve witnessed ‘behaviours’ amongst cliques which marginalise ethnic minorities. There is a clear distinction between ‘high profile’ work and ‘Business As Usual’ activity for which staff are divided. 'In-group' members get the 'quality' work, which allows you to acquire the best competency experience. Ethnic minorities tend to be stereotyped into ‘BAU’ low end roles, which can be devalued. Such work is considered ‘less demanding’ and carries a heightened risk of 'Box 3'. Once you are locked into these roles, it’s very difficult to escape the downward spiral trap. For certain generalist jobs, each Department and unit interprets competency guidance very differently. In some cases, you need such specific experience, that the only way to be shortlisted is to have previously done the job in a more junior grade or on temporary promotion. Therefore one might reasonably question whether recruitment is always fair. Some senior managers may be very selective when choosing to involve junior staff in conversation on social and professional activity. Group dynamics will include some, yet shut out others in the same grade with comparable potential. In-group leaders will offer coaching, training and advice to some, whilst denying it to others. Most crucially, the line manager will open a wider network for their protégés, spreading the reputation of their capabilities to other seniors, whilst ignoring the efforts of others. Mistakes made by 'in-groupers' will be conveniently ignored as 'inexperience', whilst that by the marginalised will be marked down. Therefore double-standards do exist. Some ethnic minority staff are indeed doing well, but they tend to be a mirror image of the 'metropolitan liberal elite'. Just witness the similarities in speech, education, dress and social behaviour, as one raises through the hierarchy. The prologue of this blog mentions three, and the Role Model film misses four. Concepts like unconscious bias apply to all protected characteristics, this pick-and-mix approach is confusing, inconsistent & counter-intuitive. Surely we have reached the day when we should start toning-down this focus on diversity and get-on with the day job. There is now a real danger of fostering a victim mentality among some and causing a defensive hardening of bias among some others. Mark J - Thank you for the most direct and sensible comment I've read so far. I agree with Mark J’s comments. I would also add that the problem with the politics of ‘diversity’ is that it actually threatens to undermine essential principles of equality. For example, rather than encouraging people to be colour blind, gender blind, etc – as has increasing been the case over recent decades – it demands that we become more conscious, or ‘aware’ of these things - and worse, recruit and promote people based on ‘protected characteristics’. I am terminally sick of having diversity - especially with LGBT issues pushed down my throat. Can someone please explain how a person's sexual preference has anything at all to do with their job ? If anything - after many years in the CS I have witnessed the most outrageous and blatant positive discrimination - where some people are promoted way above their capabilities simply to satisfy the Home Office's obsession with representation of a minority group. Surely promotion should be based purely and solely on ability to do the job - and not based on gender or sexuality in order to appease certain people who will use discrimination issues to get their way ? Incidentally - I am female - and in the last 10 years I have noticed a hugely disproportionate number of female managers. Diversity ? I rest my case. Some very interesting points regarding diversity coming up here. I have always thought of it as a double-edged sword in that, as mentioned, it promotes the idea of treating people equally whilst telling you that people are different and these differences should be taken into account. It is very much misunderstood in my experience of managers. They have raised the obvious 'differences' such as colour, race, religion, gender etc. My argument was that everyone as a whole should be considered in that case, as people are different in myriad ways above and beyond such things. This was not understood and I was thus informed that I was exhibiting 'negative behaviours'. Suffice to say, my argument about me being me and therefore my diversity should be respected and my feelings of being told I am being negative for wanting to expand on what we are constantly told is such a serious issue, fell on deaf (or plugged up) ears. Equality and diversity are also about making it possible for working mums to work. I joined the Civil Service 9 months ago and am loving it, but finding a working pattern that enables me to find work-home balance is a work in progress. I have made several suggestions of working patterns that would both fulfil my need to be available a bit more for my children and which I also think at EO grade would make me sufficiently available for my team, but I keep getting 'business needs' quoted back to me. I think there is work to be done on this front. Anon, line managers should explain precisely what the business need is. If they are using the phrase as a 'trump' card, this sounds like a breach of HMRC values/behaviours? Thanks for all these comments on my blog. It’s good to see such a lively debate, and useful to have your advice on the issues that concern you most. I do believe that addressing diversity and inclusion is a very important priority for Civil Service leaders for the reasons Jeremy, Sue and I set out in the meeting and this blog. But I am also clear that we must stick to a principle of meritocracy in appointments and promotions. Positive action to create more opportunity for underrepresented groups should not slip into positive discrimination in favour of them. I have noted the points made about discrimination on grounds of age and the importance of better understanding the experiences of transgender colleagues and the barriers facing those with disabilities. As I said at the launch event, things will only change if we make them change, and the Talent Action Plan sets us a new challenge. The principles being championed here around merticocracy and removing barriers are all very well. But the Civil Sevice has to demonstrate that it is paying more then lip service. We have a long way to go and are making the problem worse in some areas. For example my employer, the Home Office, has recently introdiced a policy which prevents flexible working and flexi time being offerred to probationers. This will have an almost certain adverse impact on carers and could prevent some candidates from taking up appointment. Yet it's introduction has been waved through without protest. The principle of meritocracy when it comes to recognition, appointments and promotions is key but so is the principle of equitable treatment. Concern appears in this blog because of frustration that people are not being dealt with equitably, in terms of common decency being paid, policies applying consistently, results being valued, potential being reached, simply because of characteristics that have not found favour. It is ironic that when some of those considered to be "outside the norm" were in a greater minority that they then did receive positive discrimination; nobody who identifies with a minoirty wants that any longer. Rather, we want to be recognised for our excellence, not a random characteristic or a label that has lazily been applied. I don't think that it is reasonable for an employer to look in to our unconscious, whatever that means,I think that our employer has a reasonable interest in our conduct at work, but I have two objections one that the employer is not respecting the fact that most of us are well brought up moral people who don't need to be instructed by the service, and secondly that we are all entitled to our private space and conscience, we are entitled to our own thoughts no matter how nasty they are (who decides what constitutes nasty is another matter) as long as we don't act on them or allow them to interfere with our work. I think that it is reasonable for an employer to look at its managers and staff unconscious bias when it is four to five times more likely that a disable civil servant will just receive a “must improve” box marking over and above the next disadvantage group and then take them anything up to 40 years to be promoted by just one grade this equal no development for this group! There is “sticky floor” live and Well in the civil service and so not just the “glass ceiling” to clime through. Anon, you do realise that positive discrimination is illegal in Britain? The Equality Act is readibly available for you to read and check the facts. I attended the Civil Service Diversity event last month and was greatly encouraged by what I heard. The commitments in the CSTAP are ambitious (and rightly so) and I'll be watching with keen interest to see how it all unfolds - especially the bolstered offer for staff networks. My own experience of 'diversity' or lack thereof centres more around location, grade, and working pattern - none of which are really covered in any depth. Try looking for work in IT development, based in the Nort East, as a part time AO. Despite the skills to do many such jobs, when I have enquired prior to applying I have been told 'there are no part time opportunities'. Yes, I made the conscious choice to work part time due to childcare responsibilities. Should that stand in the way of putting the right person in the right job? I've had some great feedback to say that my IT studies have been focused in the right area when/if any vacancies appear. But whether I will ever get the chance to put that learning into practice in real life due to where I live remains to be seen...I've been on the hunt for at least 7 years now, current 'opportunities' are only being offered to staff who are already lucky enough to work in the right place (Leeds) and already work in the IT field. Thanks for sharing nice blog post Promo Staff.